The majority of people diagnosed with colon cancer are older than 50. 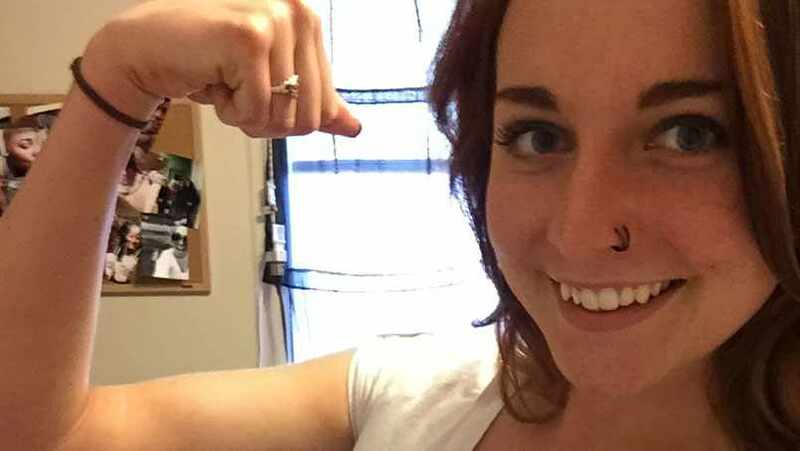 Kelly Barnard was just 19 years old when she got an unwelcome Valentine’s Day surprise. Her stomach pain turned out to be something much more serious. Among cancer's many negative qualities is the seemingly indiscriminate way the disease manifests itself. Cancer doesn’t care what your race, gender or ethnicity is. It doesn't care about your profession where you live or your family situation. And it doesn't necessarily care about your age. Just ask Kelly Barnard. Kelly's cancer story began when she was just 19 years old. Then a freshman at the College of St. Scholastica in Duluth, Minnesota, she began feeling intense stomach pain one day in her dorm room. And while she tells the Duluth Tribune she'd "felt some little twinges of pain" in her stomach before, those were nothing like the pain she felt just before Valentine's Day 2013. "It was horrendous," she tells the newspaper. "I couldn't walk. I couldn't move." What Kelly could do, however, was call her mom, Beth LaVigne, who drove to Kelly's dorm and whisked her off to a local emergency room. There, doctors told her something she never expected to hear. "They said it looked like my ovary had basically exploded, for lack of a better word," she says. Kelly underwent emergency surgery to remove a cyst from her ovary and was then sent home to recover. Four days later, on Valentine's Day, Kelly's phone rang. Her doctor said she wanted her to come back to the hospital and had more unexpected news. Kelly had colon cancer, and it was "metastatic" and had spread to her ovary. "I was in shock," Kelly says. "I felt like maybe I'd heard the doctor wrong or that she was mistaken." But there was no mistake. After telling Kelly how sorry she was to have to deliver such distressing news, the doctor said a surgeon was waiting just down the hall to meet with Kelly and her mother. "My mom and I took a few minutes to cry and hug before going to that appointment," Kelly says. "I don't think I fully understood what my diagnosis meant or how serious it was." But she adds, "I don't remember ever being so scared." After reviewing Kelly's diagnosis, the surgeon suggested they "take some time" before implementing a treatment plan against her cancer. "They were deciding whether to implant a stent and start chemo immediately or surgically remove the tumor from my descending colon," Kelly says. Time wasn't exactly something Kelly or her mom thought they could spare, so they called Mayo Clinic's Rochester campus for a second opinion. "They told us to come immediately," Kelly says. "Being accepted by Mayo was such a bitter sweet moment," Kelly says. "I was thrilled to be able to have such prestigious and well-known doctors looking at my case, but at the same time, I knew it meant my case was extremely life threatening." At Mayo, Kelly met with colon and rectal surgeon Robert Cima, M.D., who decided that immediate, and aggressive, surgery would be her best chance for survival, especially given her young age. But Kelly says nothing happened until Dr. Cima and his team were absolutely sure that she understood, and was comfortable with, everything that was about to happen. "When they decided to perform the emergency surgery to remove the tumor, the surgical team was so calming and reassuring," Kelly says. "I always felt safe and that I was in the best care possible. Whenever I felt anxious they would distract me by telling me about themselves and asking me questions to help keep my mind off of the unpleasantness." Fortunately for Kelly, Dr. Cima and his surgical team were able to successfully remove her tumor. What's more, the cancer has been kept at bay for the two years since, which as Dr. Cima tells the paper, is good news for her long-term prognosis. "What we do know is 85 percent of all recurrences occur within the first two years," Dr. Cima says. "She's two years out with no clinical evidence of recurrence. Each day is a win." Those wins, Kelly says, couldn't have come without her care team at Mayo. "Everyone was so friendly and made sure I knew what was going on at all times," she says. "I feel like the needs of myself and my family were exceeded. I am eternally grateful to Dr. Cima and his team. They saved my life." And they did it all, Kelly says, while keeping her best interest, and her quality of life, at the forefront of every decision about her care. "Even though I came to Mayo because of a terminal illness, I have nothing but positive memories of being there," she says. " And even now when I go back for follow up appointments, everyone seems so excited to see me and to see how far I've come. I would recommend Mayo Clinic a thousand times over to anyone dealing with a similar condition."